In a special ceremony held prior to the opening game of the 2006 season on Sept. 16, the Mercer men's soccer team honored four of its "greats" from years past. All four players were aacomplished members of Vikings squads, who have gone on to make their marks in the world of soccer in a variety of ways. A memorable part of the ceremony was the retirement of the no. 1 jersey worn by 1991 MCCC goalkeeper Keith Engelhardt, who played for the Vikings when they went 24-0 and won the national championship. 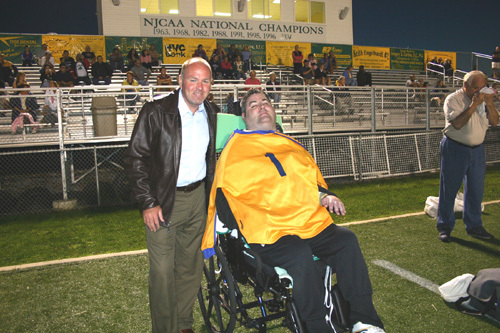 MCCC Athletic Director John Simone led the ceremony, recalling the incredible three months in 1991 when Mercer battled to a perfect record, including a thrilling 1-0 victory over Yavapei College (AZ) for the NJCAA national title played on Mercer's turf before a hometown crowd. Simone noted, "Mercer was led that fall by perhaps the greatest goalkeeper in the team's storied history. Keith Engelhardt recorded 20 shutouts, surrendering just two goals the entire season for an unbelievable 0.08 goals per game average." 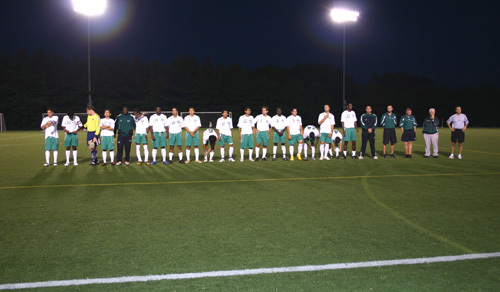 Following his Mercer career, Engelhardt earned an athletic scholarship to Virginia Commonwealth University, then played professionally for the NJ Stallions and the Philadelphia KIXX. He also gave back to New Jersey's youth by establishing the "Make the Save" goalkeeping academy in 2000. In 2002, Engelhardt's career came to halt when he was paralyzed in an auto accident. Yet according to Simone, he has not given up. "The word 'quit' is not in Keith's vocabulary," Simone told the crowd. 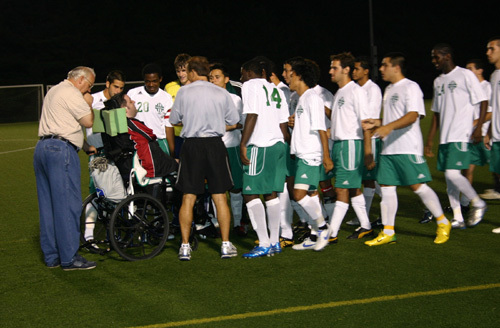 "He continues his rehabilitation and is making steady progress, now doing what he loves most - giving back to the game of soccer." Engelhardt is a goalie coach for Toms River High School South. 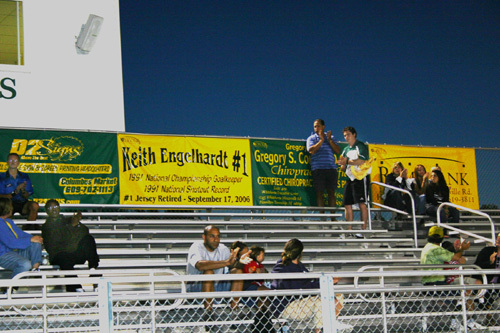 "Keith Engelhardt is a hero and role model for all of us. He has been dealt a serious setback, but has handled it courageously and with class and dignity," Simone said. "For his contributions to Mercer County Community College and the great game of soccer, Keith Engelhardt becomes the first Mercer player ever to have his uniform jersey retired." Honors also went to three other stellar Vikings athletes, who were inducted into the MCCC Soccer Hall of Fame. Bill Andracki ('89), Mercer's talented goalkeeper during the 1989 season, went on to play goalie for Rutgers University and then had a lengthy professional career. During his years with the Rochester Rhinos, Andracki helped them to two A-League championships (1998 and 2000) and the Lamar Hunt U.S. Open Cup championship in 1999. Among Andracki's records with the Rhinos are: all-time regular season wins (45); all-time regular season saves (348); all-time single season minutes played (2,559 - 1997); games played (28 - 1997); starts (28 - 1997); most saves, regular season game (13); all-time playoff saves (35); and all-time U.S. Open Cup wins (6) and saves (53). 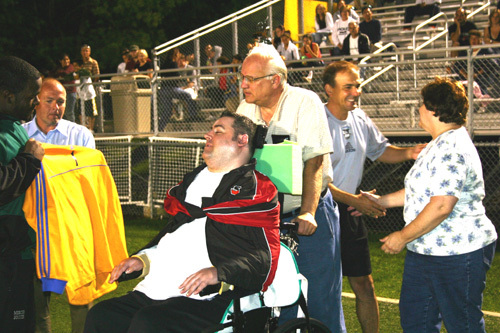 Before going to Rochester, Andracki played for both the Atlanta Magic in 1994 and the Atlanta Ruckus (previously the Atlanta Silverbacks) in 1995. Former goalkeeper Keith Engelhardt is presented with his retired jersey by current MCCC goalkeeper Justin Grant (far left). Also pictured (left to right) are Hall of Fame inductee Gerry McKeown, Engelhardt's father Tom, MCCC Head Coach Charlie Inverso, and Engelhardt's mother Linda. permanently at the MCCC Soccer Stadium. Dean College (MA), which Mercer won 4-0.
and the other Hall of Fame inductees. Gerry McKeown was an indispensable midfielder for Mercer in 1978 and 1979, earning All-American honors in his second year. Following graduation, McKeown went on to star at North Carolina State University, leading the team to a Top 20 national ranking and garnering All-ACC honors. He played professionally for the Carolina Lightnin', the Carolina Gold and the St. Louis Steamers, as well as U.S. Open Cup champs FC Kristi. Presently McKeown is boys director of coaching for New Jersey's Player Development Academy (PDA), one of America's elite youth soccer clubs. He is the former head coach at St. Peter's College. He has also coached in the Olympic Development program for New Jersey's under-18 team and Region 1's under-15 team, and has served as an assistant with the U.S. under-15 team. Glenn "Mooch" Myernick, a valuable midfielder on Mercer's 1973 team, has had great success as both a player and a coach. He went on to play at Hartwick College (1974, 1976); the U.S. Men's National Team (1975-1979), serving as captain in 1978; the U.S. Olympic Team (1975); the Dallas Tornado (1977-1979); the Wichita Wings (1979); the Portland Timbers (1980-1982); and the Tampa Bay Rowdies (1983-84). On the coaching side, Myernick is one of only two U.S. coaches to play on and then later coach both the U.S. Men's National Team (2002 and 2006) and the U.S. Olympic Team (1996). His international coaching experience also includes assisting the U.S. under-20 men's national team in 1992 and coaching the U.S. under-17s at the 1995 under-17 World Championship. Myernick spent four seasons in Major League Soccer, serving as head coach of the Colorado Rapids (1997-2000), a team that made the playoffs every year under his leadership and earned a franchise-best 20-12 record in 1999.